One of the most common requests I get as a dental technician is to make dental restorations, like veneers, as white as possible. Before you go to the dentist to whiten your teeth or get a set of new veneers, you might want to try a whitening toothpaste at home, first. Many people get satisfactory to fantastic results this way. As evidence, teeth whitening toothpastes are so popular, that stores near my home put them inside theft-proof boxes to keep them from getting stolen! Compared to normal toothpaste, they're not cheap. So, see below and know more about how they work, what risks they carry, and which whitening toothpastes to try out first. What's Inside Teeth Whitening Toothpastes? Let me get a little specific. These toothpastes do not 'make teeth whiter' in the same way as whitening gels do. Instead, they work to remove stains and discolorations from your teeth, thereby making them appear less dull or yellow. i.e. They end up looking whiter and better. Each brand has its own special teeth whitening formula; no two brands are the same. The basic mechanics these toothpastes try to do is either scrub away stains, wash them away, make it difficult for stains to stick, create the illusion of whiteness, bleach away stains, or a combination of the above. Scrub away stains - Hydrated silica and Sodium Bicarbonate (Baking Soda) are common in many whitening toothpastes because they act as mild abrasives that help scrub away surface stains. Non-Stick Coating - Some whitening pastes use ingredients like Polyvinylpyrrolidone (PVP), which has the ability to coat the teeth and making it harder for new stains to stick. Cleaning - Sodium Tripolyphosphate is a food-grade detergent which is included in many of these toothpases to clean away stains. Bleaching - Hydrogen and Carbamide Peroxide are common bleaching agents used to whiten teeth. However, there is disagreement over their effectiveness in toothpaste because it needs time to soak into the enamel to do their job. Brushing teeth isn't long enough. Illusion - One ingredient called Blue Covarine plays with color and "changes the optical properties of the teeth such that their appearance is both measurably and perceivably whiter," according to a study in the International Dental Journal. Fight stain causing proteins - Calprox works at the point where stains start. Your teeth have a thin layer of protein called pellicle. Stains, food, bacteria, and plaque bond to this protein layer and do their damage. But Calprox dissolves the pellicle protein layer, helping to whiten teeth and prevent stains. How well you follow instructions. To get the best results you should follow the instructions. Sometimes a combination of teeth whitening toothpaste and another whitening product is recommended. Your expectations. If you want your teeth to get 10 shades whiter after one brushing, you're setting yourself up for disappointment. If you're looking for drastic and immediate results, you may want to look into laser whitening. How you adjust to the product. A common complaint about whitening toothpastes and whitening products in general is tooth sensitivity. Because of these variables you many have to try a couple of different brands to find one that works for you. I've listed a few brands worth looking into down below. The most common complaint is tooth sensitivity. Not everyone experiences it. But those who do may have to choose a gentler brand and wait longer to see desired results. Since most whitening toothpastes use abrasives to gently scrub away surface stains, you shouldn't use whitening toothpastes everyday for the rest of your life. It can weaken or damage your enamel as well as dental restorations like composite fillings. And if you have other damage or issues like bruxism (i.e. grinding your teeth) you may want to speak with a dentist about your situation. It's also a good idea to keep these toothpastes (and dental whitening products) away from young children. They probably shouldn't be using them unless your dentist gives you the okay. 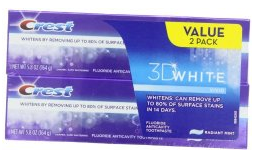 Crest 3D White Vivid - It's a top seller because it does a good job at removing surface stains leading to a whiter smile. Although some customers feel it may be too strong. Sensodyne Pronamel Gentle Whitening Toothpaste - This is a great option for people with tooth sensitivity. Supersmile - This is the #1 cosmetic dentist recommended brand. It's not as harsh as other brands and gently whitens teeth, minimizing unnecessary damage to enamel and dental restorations like veneers, crowns, or fillings. Give one of these a try and let me know how you like it. If you have a favorite whitening toothpaste brand, tell others about it below!